While New Braunfels grows ever closer to the fall season and the cooler temperatures that come along with it, the city is still within the grips of summer heat. While many can quickly retreat from the sun and into the sanctuary of an air-conditioned home. But those without an AC unit, or even worse, a broken AC, may have to live in their homes and bear the oppressive heat. As residents of Texas, we’re all used to the heat, but what are the dangers of living in a hot house? Join Legacy AC and Heating Services as we discuss some of the threats that a hot house poses to you and your loved ones. Many people in New Braunfels can relate to the inability to find sleep when it’s too hot outside. While this might sound like a simple inconvenience, the reality is that your body desperately needs regular amounts of sleep. A lack of sleep can lead to irritability and higher levels of stress. It can also affect your body’s immune system, making you vulnerable to even the smallest of colds. Not getting enough sleep can keep you from concentrating fully, putting you at increased risk of getting into accidents while driving, or you might struggle to complete tasks at work. Those who struggle to get enough sleep for long periods of time eventually face other health concerns like high blood pressure, diabetes, and heart disease. If you spend a lot of time in the heat, you might start feeling sweaty, sluggish, and sick. What you’re experiencing is an illness called heat exhaustion. These symptoms are caused by your body overheating, either from exertion or from being exposed to a source of heat, like a warm car or room. The symptoms of heat exhaustion include sweating, faintness, cramps, a rapid, weak pulse and headache, and nausea. If left untreated, heat exhaustion can quickly become a case of heatstroke, which can lead to death if not immediately treated. Heat rises naturally, and in your home, that means that the heat rises to the highest floor of the building, or the attic. This heat can trap moisture in your attic. This combination of heat and moisture leads to the growth of mold colonies along the framing of your roof. Mold in your attic can weaken the overall structural integrity of your roof, and cause drafts, and lift shingles off the roof itself. The result is a hot, moldy, attic that’s slowly disintegrating your roofline from the inside out. Dehydration is when your body is losing more liquids than it’s taking it. Your body lacks the fluids it needs to function normally. A failure to replace these fluids leads to dehydration. Dehydration is exacerbated by the ambient heat of a room and can be particularly deadly to children and the elderly. If you’re dehydrated, you likely have felt a sense of dryness in your mouth, have felt irritable, confused, and fatigued. While dehydration can largely be addressed by drinking more fluids, those with extreme cases of dehydration should seek immediate medical assistance. 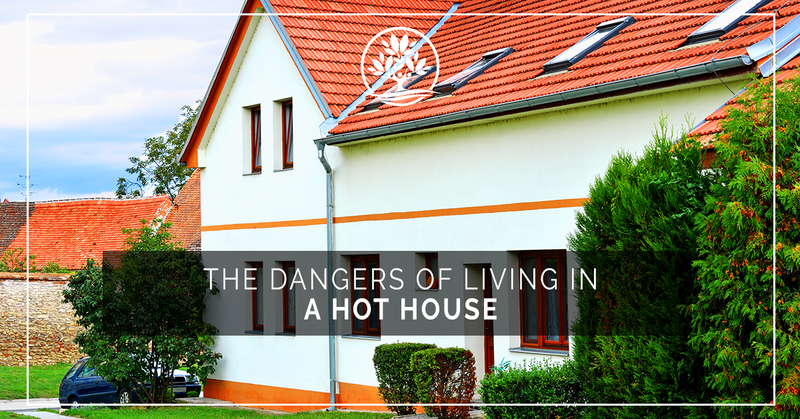 Your hot house has a greater impact on your health than you realize. Stay safe this summer and keep your home cool. If you’re looking for an air conditioner repair service in New Braunfels, be sure to give the experts at Legacy AC and Heating Services a call. For more than 30 years, we’ve helped residents keep their homes cool and beat the summer heat. With our free estimates on our work and financing options for new air conditioners, there’s no reason for you to sit and suffer in a hot house this summer. Call us today to schedule your AC repairs!